Yesterday, Jenny and I attended a “Mystery Dinner” which was Star Trek: The Next Generation themed. We had some fun characters, our hosts were Worf and Dr. Crusher, and Jenny and I were Guinan and Data. It was fun to play Data, because he’s the only character from Star Trek that I know much about, and I think he’s hilarious. Other than a 3-second bit stretch, I didn’t do too much “in character.” That 3-second bit included an intentionally delayed laugh after someone told me that they had told a joke. 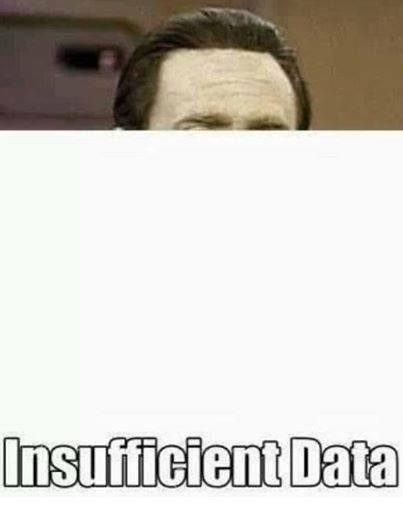 Apparently, my efforts to laugh like Data were a little too accurate. His is a very loud and obnoxious laugh, and in my gusto, I surprised our hosts’ baby, which upset her. Thank God for breast-feeding, though, because she was easily distracted, and balance returned to the Force. I’m particularly tickled by my poor attempts to get all the references, because I’m notoriously terrible. I put up my Vulcan salute, and proclaimed, “May the Force be with you!” Much laughter ensued, and for you in the know, this is my little joke I play on myself, to make sure people KNOW I have no idea what’s going on. I’m terribly bored by science fiction most of the time, and I’ve never been able to quite dive in to ST:TNG. I may try again soon, because I have rekindled my one-time love of Data, and my curiosity is whetted for the chance to learn more about Lal, and Data’s other adventures. Meme from George Takei’s Facebook account. I cannot tell you how many times we all said, “There is insufficient Data at this time,” because we were playing a scripted, “Who stole the awesome thing?” mystery game. Since we were constantly left guessing at our own motives, we couldn’t keep too many secrets, nor could we tell too much about ourselves, because we just didn’t know! That sounds like a lot of fun 🙂 Thanks for dropping in at Bipolarly. I missed reading your posts while I was out of town.